Some types of horse bells are riveted or screwed to a metal bracket or arch that is designed to be attached to the horse's harness, to the shafts or pole (tongue) of a vehicle, or to the vehicle body itself. The bells mounted to the bracket may be crotals (sleigh bells) or open-mouth bells. Most often, however, the bells are chimes. A chime, in the horse bell world, is a type of open-mouth bell that has two or more clappers. The clappers may hang inside or outside the bell. 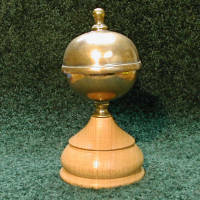 The bell itself can be any shape; most modern chimes are often shaped like a bowl. If the bracket attaches to the back pad or saddle of the harness, the bells are called saddle bells or saddle chimes. If the bracket attaches to the shafts, the neck pole, or the vehicle body of a buggy, wagon, or sleigh, the bells are called shaft or pole bells or sometimes "ice cream" bells. A special type of bell, the foot gong, is a single large bell mounted on a plate that is bolted underneath the vehicle. Many saddle chimes or saddle bells (also known as Russian saddle bells) are attached to an arched metal bracket. The shape of the brackets can range from the simple to the extremely ornate. Each end of the bracket is usually held onto the harness saddle by the rein terrets that screw onto the sides of the harness saddle. Terrets are large loops of metal through which the lines (reins) pass. They ensure the lines travel freely from the horse's mouth and the driver's hands. Another style of saddle bell has a single threaded end at the bottom of the bell housing. This type of saddle bell bolts in place of the rein hook that is usually found in the center of the harness saddle. There is really no essential difference between shaft bells, pole bells and "ice cream" bells. The name varies depending mostly on the object to which the bells are attached. 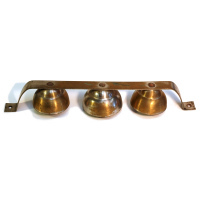 These bells are usually mounted on a supporting bracket made of brass, iron or steel. Some bells are attached instead to a leather strap that is buckled or tied around the pole or shaft. The bells are called shaft bells (or shaft chimes) if they are attached to one or both shafts of a single-horse vehicle. They are pole bells (or pole chimes) if they are mounted onto the pole (tongue) of a vehicle pulled by a team of two or more horses. 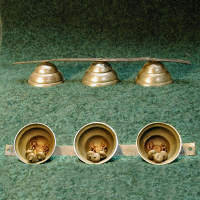 If the bells are attached to the body of the vehicle itself, they are often called "ice cream" bells, because this type of bell was often used on vehicles used to sell frozen treats in city neighborhoods. The motion of the vehicle or the driver's hand is used to sound these bells. Foot gongs are also known as Bermuda carriage bells or "ding dong" bells. 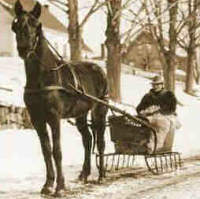 This type of bell was used on early automobiles as well as horse carriages. Foot gongs were produced from the very late 1800s through the mid 1900s. Two large hemispherical brass shells resonate when struck to produce a loud, distinctive sound. Most bells ring continuously from the motion of the vehicle or horse, but a foot gong sounds only when the pedal is pressed. This allows a foot gong to be used as a warning device much like the horn of today's automobiles. 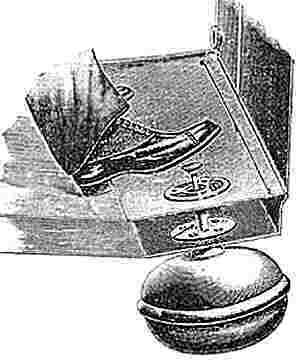 A foot gong was mounted underneath the floorboards of a carriage or early automobile. The shaft of the gong protruded through a small hole in the floor of the vehicle and ends in a small pedal. The driver pressed the pedal with his foot to sound the gong. We do not sell foot gongs. The best place to find vintage or antique foot gongs is eBay and other online and local auction sites. Manufacturers include Bevin Bros. Mfg. Co., Gong Bell Mfg. Co., and Starr Bros. Bell Co., all of East Hampton, Connecticut; Sutone Corporation of Los Angeles, California; VelveTone; Phoenix; and many others. Parts can be missing or damaged in these gongs, so check carefully before you bid or buy. New foot gongs are nearly impossible to find. Bevin, while still in business, no longer makes foot gongs. Sutone and Starr Bros. have been out of business for decades. A company called Allegre, based in Portugal, lists foot gongs on their website, but I have no personal experience with this company or its products. New foot gongs from Asia are sometimes sold on eBay, but I have heard from buyers that the sound is poor.